Images A, B and C were recorded under identical illumination conditions, identical exposure times and each with EM gain set at x1000. The benefit of Photon Counting under conditions of low Clock Induced Charge (CIC) are evident. Images D and E are derived from a larger number of accumulated images, to yield a greater measurable signal to noise ratio. An identically positioned Region of Interest on each image was used to determine S/N of 3.86 and 6.02 for standard and photon counted images respectively. This factor improvement is in accord with the theory of Photon Counting circumventing the influence of multiplicative noise (noise factor) in EMCCD signals. Photon Counting in EMCCDs is a way to overcome the multiplicative noise associated with the amplification process, thereby increasing the signal to noise ratio by a factor of root 2 (and doubling the effective Quantum Efficiency of the EMCCD). 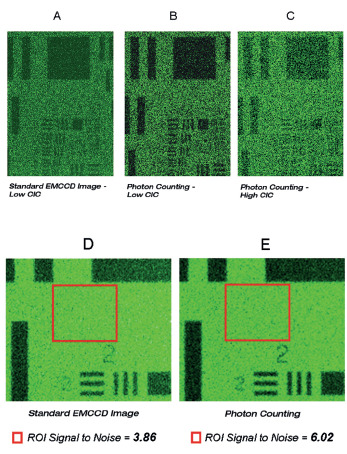 Only EMCCDs with a low noise floor can perform photon counting. The approach can be further enhanced through innovative ways to post process kinetic data. The industry-leading darkcurrent and Clock Induced Charge (CIC) specification of Andor’s back-illuminated iXon Ultra 897 and 888 models render them uniquely suited to imaging by Photon Counting. Photon Counting can only be successfully carried out with very weak signals because, as the name suggests, it involves counting only single photons per pixel. If more than one photon falls on a pixel during the exposure, an EMCCD (or an ICCD for that matter) cannot distinguish the resulting signal spike from that of a single photon event, and thus the dynamic range of a single frame exposure is restricted to one photon. To successfully photon count with EMCCDs, there has to be a significantly higher probability of seeing a 'photon spike' than seeing a darkcurrent/CIC 'noise spike'. The iXon Ultra 897 and 888 have the lowest darkcurrent/CIC performance on the market, yielding both lower detection limits and higher contrast images. Under such ultra-low light conditions, 'photon counting mode' imaging carries the key benefit that it is a means to circumvent the Multiplicative Noise, also know as 'Noise Factor'. Multiplicative noise is a by-product of the Electron Multiplication process and affects both EMCCDs and ICCDs. In fact, it has been measured to be significantly higher in ICCDs. The noise factor of EMCCDs is well theorized and measured; to account for it you increase the shot noise of the signal by a factor of square root 2 (~x1.41). This gives the new 'effective shot noise' that has been corrected for multiplicative noise. The effect of this additional noise source on the overall Signal to Noise ratio can be readily viewed in the S/N plots in the technical note entitled 'EMCCD signal to noise plots'. Figure 2 - Schematic illustration of how photon counting can be applied to a kinetic series as a post processing step, affording increased flexibility in 'trial and error' trading SNR vs temporal resolution. Photon Counting Mode does not measure the exact intensity of a single photon spike, it merely registers its presence above a threshold value. It does this for a succession of exposures and combines the individual 'binary' images to create the final image. As such, this mode of operation is not affected by the multiplication noise (which otherwise describes the distribution of multiplication values around the mean multiplication factor chosen). The end result is that low light images acquired through this mode of acquisition are improved by a factor of ~x1.41 Signal to Noise, compared to a single integrated image with the same overall exposure time. To successfully photon count with EMCCDs, there has to be a significantly higher probability of seeing a 'photon spike' than seeing a darkcurrent/CIC 'noise spike'. The lower the contribution of this 'spurious' noise source to a single exposure within the accumulated series, the lower the detection limit of photon counting and the cleaner the overall image will be, as demonstrated in Figure 1. The iXon Ultra 897 and 888 have the most effective combined cooling/CIC minimization on the market, lower than other competing EMCCDs utilizing the same 512 x 512 or 1024 x 1024 sensors. As such, the detection limit for Photon Counting is markedly lower. The iXon intuitively offers Photon Counting modes, either as a real time acquisition or as a post-processing step. OptAcquire can be used to first optimize the camera for Photon Counting acquisition. As a post-processing analysis, the user holds the flexibility to 'trial and error' photon count a pre-recorded kinetic series, trading-off temporal resolution vs SNR by choosing how many images should contribute to each photon counted accumulated image. For example, a series of 1000 images could be broken down into groups of 20 photon counted images, yielding 50 time points. If it transpires that better SNR is required, the original dataset could be re-treated using groups of 50 photon counted images, yielding 20 time points.